Did Jesus claim to be the Messiah? What Vos discerned in his day applies equally to ours: “a certain class of writers” regards with “disfavor... the Messianic element in the Gospels.” His comprehensive, detailed refutation of such writers, first released in 1926, has helped evangelicals answer these questions affirmatively for more than seventy-five years. "Vos's insights are penetrating, refreshing, and orthodox. His rebuttal of Wrede's 'messianic secret' theory is, in my opinion, devastating. Besides all this, the book is a superb defense of the deity of Christ." "The reappearance of this volume is most welcome. 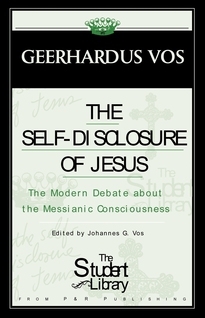 Vos's treatment of the messianic identity and self-consciousness of Jesus revealed in the Gospels (though dated at points where it counteracts largely moribund errors of 100 years ago) is of enduring value."